Back in the TV days of the plexiglas map, the grease crayon and magnets, any weather information received came via the teletype and it was a little slow to get there. Not so much these days now. No, there are computers everywhere. You have desktop PCs, laptops, PDAs, Blackberries, cellphones, the technology is everywhere and it's very fast. And it seems like it changes almost every week. Yes, it does. The technology changes so fast that it is hard for the Hurricane Center and government in general to keep up. It's one of the things we're always faced with, trying to catch the latest technology. But there are a lot of efforts underway to keep moving forward and embrace new ways of sharing information. How did you end up here? Do you have a science or meteorology background? It's an interesting story. I've always been interested in meteorology. Most meteorologists have a weather event that they look back upon, and mine was the blizzard of '78 growing up in New England. I was four years old at the time, and I remember looking out the window and I couldn't see the back door. It was completely shuttered in with snow. We had about six feet of snow with drifts up to ten feet. Yes, that was it. It really sparked my interest in meteorology. I went to undergraduate school at the State University of New York at Albany and earned a degree in Atmospheric Science, and then got my Master's degree in meteorology at Penn State. Throughout college I was interested in forecasting, but my first job out of college was working for the (National Weather Service) training center in Kansas City. I was teaching how to use the Advanced Weather Interactive Processing System (AWIPS). And from there I got into computers and my career led to The Weather Channel and BellSouth.Net to here. So, somewhere in your undergraduate and master's program you had this tech background? No, I just fell into it by accident. During my master's thesis work, my advisor was very much into computer programming. I dabbled around in it and it sparked my interest. The funny thing is I didn't own a computer until I finished my first job. So I always did all of my experiments on other people's computers. After I left Kansas City, I went to The Weather Channel for about a year and half. I enjoyed the work there, but it was the Dot Com bubble and everyone was into the Internet, so I joined BellSouth.Net and did some internet support for their DSL services. But I discovered I really missed meteorology. Luckily I had met some folks through the training center in Kansas City who worked at the Hurricane Center. There was an opening and I ended up here. What was your entry level position? It was basic computer support for the technical support branch. That position is a real good way to delve into computers and technology at the Hurricane Center supporting the hurricane forecasters, the hurricane warning and marine forecast programs, computers in general and some office support. So if something were to go wrong, you were the go-to guy? Exactly! I'd get the phone calls at three in the morning saying they could not get the forecast transmitted, the printer was not plotting the model data that they needed, that type of thing. And so I really kind of grew into that job over the course of about two years. Then I went to the Weather Service Forecast Office (Miami/South Florida) here in the same building, working as the Information Technology Officer for about two years. That was when the hurricane season got very busy in 2004 and 2005. Then I came back to the Hurricane Center. What is your title and what are your duties? My title is meteorologist/programmer. My main duties are programming the National Hurricane Center web site. I also have duties to support the storm surge unit during landfalling storms. And like many jobs, I tend to get pulled into many different directions. I do a lot of programming for our AWIPS system, which is undergoing a major upgrade, the next generation. I help administer the PBX telephone system and perform all sorts of little odds and ends. Let's talk about the Web site. It has come a long way in recent years. Yes, it is probably one of the most popular Web sites in the entire National Weather Service – mainly when a hurricane is starting to make landfall or is threatening a U.S. coast or the Caribbean Islands. Our hits go up tremendously. In 2005, we logged 1.5 to 2 billion hits over the season. And that traffic has remained steady. What's interesting now with the Web site is that we have a mobile version of it, so folks can get advisories on their cell phone, PDA, Blackberry. It really makes getting the hurricane information out to the public that much more important as well as more convenient for our end users. It is a very interactive site!! Yes, we have tried to make it more interactive in the past few years. We've added the main map on the front page where folks can click onto the storm and get information about it, NHC's official forecast and advisories. We also have a section for marine forecasts, where users can select any type of marine data they are looking for. And we have cross links to our sister offices such as Ocean Prediction Center. The Web site is constantly undergoing revision. We are trying to organize it a bit better and we are looking to make more information available up front. We want to reduce the number of clicks people need when searching for information. What is the deal with everyone wanting GIS data? GIS is very popular. It is interesting because for many years, the GIS format was largely produced in data files called shapefiles. And now Google has really changed that with Google Maps and Google Earth. The government does not always embrace new technologies quickly but in the GIS world we have really become nimble and we are starting to offer many more GIS products. For example, we are going to be displaying our storm surge data this season with Google Maps. It allows the user to see map names, city names, and on different backgrounds. You can zoom in, zoom out, pan, and it makes the user experience a lot easier when looking at the data. One of the most common requests that I received last year from the users was being able to display city names on the forecast cone map. One of the challenges we have here is that the tropical cyclone graphics are produced on some software that is somewhat restrictive in terms of flexibility. We're looking to significantly improve that display. We found that the Google maps application used in NWS offices has really allowed the data to be displayed in a more customized world and the customers appreciate that. Is there a chance this hurricane season? We are hoping to get something out this season. Once the season starts, it gets so busy supporting the storms and things, but I think the storm surge maps will be a good starting point to get some feedback from that new display. And then we will be expanding into other graphics. But yes, it is definitely a top priority. What other things are coming? One of the nice things we have been experimenting with is the audio podcasts (during a U.S. landfalling hurricane). Those have been very popular. We will be doing those again this year. We are also looking at doing some experimental videocasting this season. We are looking to rearrange the front page a little bit differently in terms of adding more storm information for each particular tropical cyclone right up front. We have the map where people can click on the active storms to get data, and we're looking to add more data in our traditional storm table. It is not going to change dramatically, but just have more information available so you won't have to click as much. What is the most popular item on the Web site? In the offseason, users really look for marine forecasts. We have a marine branch here that provides high seas and offshore waters forecasts. Folks are always seeking that data. The NHC archives are very, very popular. We get a lot of feedback from customers through e-mail with questions regarding past storms, most extreme storms, that type of thing. And then once the season starts, the number one request besides satellite data is the new graphical tropical weather outlook. Folks have really enjoyed that new graphical outlook. It is probably the most successful new product we've had on the Web site at the hurricane center. I love the variety. I love coming to work. It's always a new challenge every day. You never know who or what will need help, whether it be in operations or elsewhere. I have the ability to work on the Web site, interact with the public and help them retrieve the data they need to make important decisions for storms. And I have the ability to interact with other NWS offices and customers, and play around with new technology. Is there a downside to the job? One thing with government is that it sometimes doesn't move as fast as I want it to, but sometimes that's good so that I don't go off in ten different directions at once. But that is not really a downside. I really love my job. 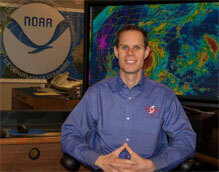 It combines meteorology and new technology – two of my favorite hobbies. Oh, I definitely want to stay with the Weather Service, but probably not South Florida. Growing up in New England, I miss the change in seasons. Boston is a little far north, but I love the West. The inter-mountain West is gorgeous, so I'd head to a little cooler climate. Plus scenic railroad trips out there are phenomenal!